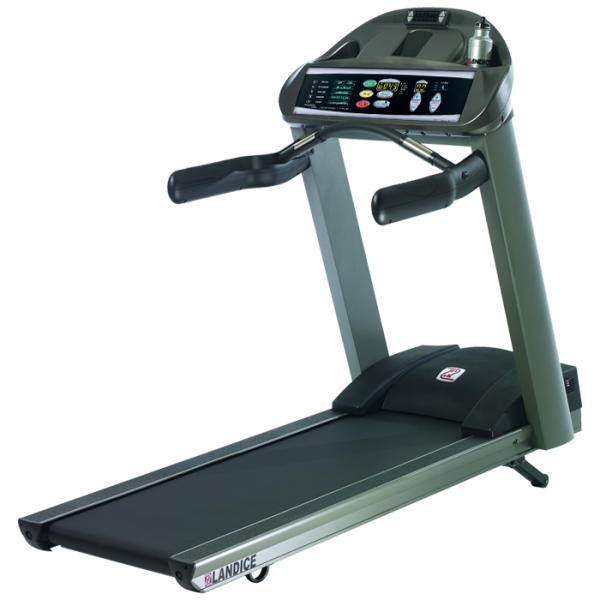 Reconditioned Landice L7 Commercial Treadmill only 2 left! The Landice L7 Treadmill is the worlds most Versatile Solution for Rehab and Conditioning. With a Zero starting speed Landice L7 Treadmill is ideal for rehabilitation, physical therapy, and sports conditioning. The Landice L7 surface is 20” x 58” and has a 400-pound user weight capacity. From treating the most acute neurological or post-operative conditions, to training world-class athletes, the Landice Treadmill is the world’s most versatile solutions for rehabilitative, medical, and sports conditioning therapy. 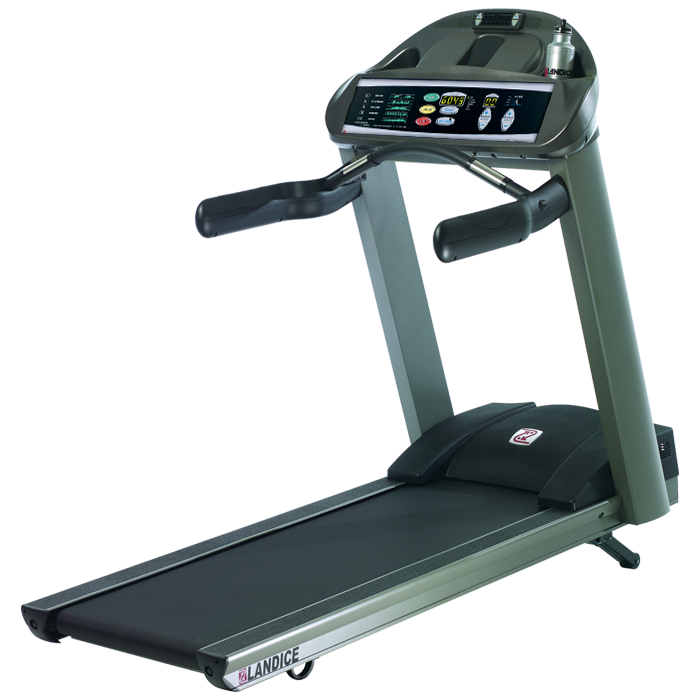 The L7 Treadmill features a 4HP continuous-duty drive motor ranging in speed from 0.1 to 12.0 mph. The rust-free aluminum frame contains a 1-inch thick reversible deck with 4-ply tread, capable of reaching a 15% elevation. 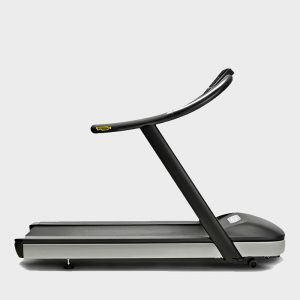 The L7 Treadmill always starts at and resets to 0.0 mph. The Landice features a low 5 1/2″ step-up height. Included is an integrated reading/accessory rack; iPhone, iPod or MP3 connectivity with the Landice Pod Grip; a personal cooling fan; high-powered stereo speakers; and a convenient water bottle holder. 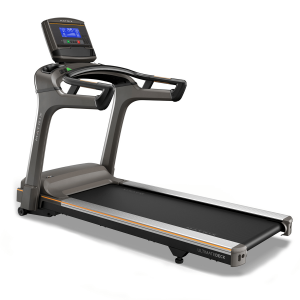 Landice is the industry leader in treadmill shock absorption. The VFX Shock Absorption System is based on medical research to provide optimum comfort, smoothness and reliability while reducing the risk of injury. Five-times softer than grass, it is designed for runners and walkers seeking significant impact reduction. Landice treadmills are built to withstand the harshest workout environments. The commercial-grade construction is quality-crafted for high-volume demand down to the very last detail, and offers the latest in engineering technology combined with old-fashioned American craftsmanship. 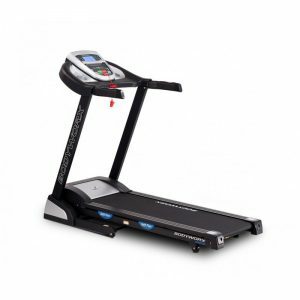 Landice has been building premium-quality treadmills for over 40 years, and has consistently been rated the number-one treadmill company by the world’s leading consumer publications. Look closer at the small details that help make Landice a truly quality product, from cast-metal end caps to the reinforced construction under our control panels. Our flywheel’s unique design and exceptional strength provide an ultra-smooth and consistent workout experience. Rollers are critical to the life of a treadmill. We go above and beyond to bring you the highest-quality, longest-lasting rollers. The effectiveness and power of a treadmill starts with the motor. Landice use an oversized motor controller that allows them to drive up to 30 amps through the motor. The elevation motor is rated for 1,000 pounds of thrust, giving it the absolute highest rating, so you can raise the level of your workout. The heart of the Landice treadmill is a 4HP continuous duty motor, so that your treadmill can withstand constant use without overheating. Running on a Landice treadmill feels softer than running on grass, thanks to the proprietary shock absorption system. Keeping treadmill friction under control starts with using an exceptional-quality belt. Landice is the only company that uses 4-ply belts on there treadmills. 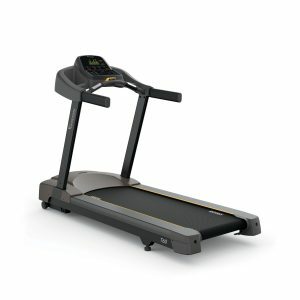 The foundation of a treadmill is the slider deck that the belt runs on. The Landice slider deck is superior in several ways and there exceptional quality starts with a solid, superior frame.